Curious about dental implants? This article gives you some basic information about them. Dental implants have completely changed the way teeth are restored. They are stable, natural-looking and easy to maintain. Learn more about these amazing restorations offered by Suburban Family Dental in Des Plaines, Illinois. Why do people need dental implants? Missing teeth do more than just leave gaps in your smile. Their absence can set off a chain reaction of problems - decay, bone deterioration, shifting - that can be difficult to treat and may result in the loss of more teeth. Each of your natural teeth is reliant on the ones next to it to stay in place and fight off decay. When even one tooth is missing, that delicate balance is thrown off. 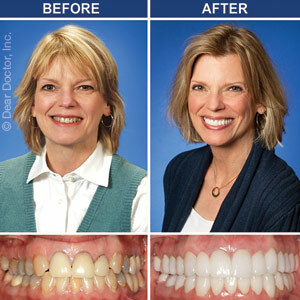 Fortunately, dental implants from your Des Plaines dentist restore that balance. Your Des Plaines dentist will make a space for the dental implant's post under your gumline. The post, made of a lightweight yet strong metal called titanium, integrates itself into your jawbone over the next few months. When the implant's post is stabilized, an abutment is installed. This portion of the dental implant sticks up through your gumline and allows the final portion - the crown - to be placed. Once your implant is finished, it will be hard to tell the difference between the restoration and your real teeth. Why are dental implants a superior choice? Unlike partial or full dentures, dental implants don't need to be removed for cleaning. They can be brushed and flossed just like natural teeth. They also last much longer than restorations like crowns or bridges, which can need repairs or replacement in less than a decade. Implants are made by your Des Plaines dentist to last a lifetime. If you'd like more information on how dental implants can improve your life, please contact Suburban Family Dental in Des Plaines, Illinois to set up a consultation with one of our skilled dentists - Dr. Roman Dziubyk, Dr. Marc Miller or Dr. Lorelei Grise.